What is a cross market arbitrage betting? Having previously looked at arbitrage/sure betting, now we take a look at how punters can alter the arbing process by aiming to achieve a successful arbitrage bet using two or more separate markets. This style of betting is known as “cross market arbitrage betting” or perhaps more commonly, “cross market arbing”. In today’s world, as the mammoth that is online betting continues to thrive, bookmakers are offering a wider variety of markets than ever before. As a result punters have become freed from the shackles of the traditional sports betting markets, for example, when betting on a football match, punters are no longer restricted to simply betting on either team a, draw or team b. There are now literally dozens upon dozens of markets available on a football match, and in actual fact on some matches the number of markets often far exceeds 100. Of course as the markets available have increased, so too has the opportunity to successfully place arbitrage bets. What is a cross market arb? Whereas a standard arbitrage bet exploits differential pricing set by separate bookmakers on the same market, a cross market arbitrage bet will aim to exploit a difference in bookmaker pricing using two or more separate markets. As we can see from this example, three bets, on three different markets, at three separate bookmakers have been placed. Only one of these outcomes can be a winner; however, by choosing such bets, at such prices, the punter guarantees a profit regardless of the match result. If match ends as a 0-0 draw, the first bet will be a winner. If Valencia score one goal or more then the second bet will be a winning one, and lastly, if Villareal win the game to nil, the third bet will be a winner. Why use cross market arbitrage betting? Firstly, with the high amount of markets now available, if we are looking for arbs across two different markets there are simply more opportunities to be exploited. Secondly and perhaps more importantly, because of their separate market nature, most cross market arbs are not all that obvious, and therefore the availability of the bet will be open for a much longer period. Because of the high number of markets that punters can now take advantage of, there will likely be several combinations of arbitrages using the cross market style available to exploit at any one time. These are just a few basic examples of the type of cross market combinations the punter can use in order to attempt an arbitrage bet. There are several different types of cross market combinations that can be used. There isn’t really a limit to the markets used for cross market arbing; as long as two separate markets offer a conflicting outcome, such as the examples shown above, then potential for an arbitrage bet should exist. Of course the deciding factor as to whether or not the arb exists is the difference in price between each bookmaker. What does cross market arbitrage betting require? As with any serious style of betting, arbitrage betting – cross market arbitrage betting even more so – requires a sound knowledge of general betting practices, odds, and how bookmakers work. If you are someone who has very little knowledge or only the most basic understanding of these, then it is strongly recommended that you take some time out and research, familiarise yourself with sports betting and particularly odds. Aside from having a good betting understanding, cross market arbitrage demands a high level of discipline from the punter. As is the same with anything really, arbing isn’t something you can carry out half-hearted and expect to yield results. It is important that the punter takes the time to sit down and work out each arbitrage possibility carefully. Be sure to calculate the returns, ensuring that the staking plan is worked out so that after each conflicting bet is placed across different markets, a secure profit is safely locked in. Use our Arbitrage calculators to help with the calculations. Does cross market arbitrage betting carry a risk? Once a cross market arb is successfully placed, assuming everything is calculated correctly, a risk-free profit is indeed secured. 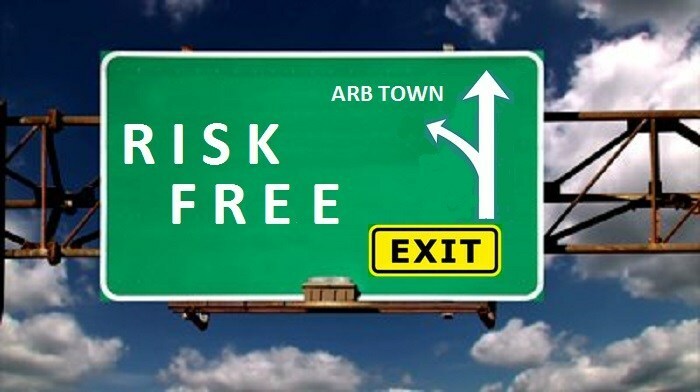 However, this isn’t to say that there are no risks attached to the entire process at all, because, despite not having to worry about the outcome of an event where a successful arbitrage bet has been placed, there are indeed other risks connected. For example, bookmakers can and certainly will make mistakes in their pricing. It is not uncommon for a betting operator to reverse the odds of any given bet. These mistakes are referred to as palpable errors; unfortunately for punters, bookmakers reserve the right to cancel the bet at any time by claiming it was a palpable error. While this might seem a little bit unfair, it is indeed true. Aside from bookmaking errors, the main risk attached to arbitrage betting, be it regular or cross market, is the fact that odds are frequently changing. These sudden movements can often make it difficult for the punter to successfully place an arb. It is often the case that you will place a bet with the first bookmaker, but, upon going to place a bet with the second you notice a change in the odds. This can result in either a reduction in profit, or perhaps even a loss. In order to minimise this risk, it is advised that punters should enter the bet with the first bookmaker and proceed until the final confirmation, then place the bet with bookmaker number two, wait for the second bet to be accepted before immediately returning to place the first. Cross market arbitrage betting is a style of betting that – if you’re to get it right – can be very time consuming. As well as taking up lots of time, in all honesty, despite being potential lucrative, it leaves plenty to be desired in terms of fun. With this in mind, if you are serious about giving it a go, but aren’t too keen on the idea of spending hours sat at your computer trawling through different bookmakers in order to identify sufficient price differences, then you should consider using an arb finding service. Unfortunately, because of the extremely high programming effort required, good services aren’t available for free. Having said this, one such service (Rebel Betting) who’ve been subject to several good reviews and seem to be renowned for their proficiency, offer punters the option to download their software for free in order to demonstrate their methods. However, Rebel Betting’s free download only really acts as a simple taster, as it only provides information on arbs up to 0.6%. In order to see higher gains from the arbs provided a subscription will be required.